This has been my most favorite pet product review yet. Maya loves the Kyjen Puzzle Dog Toys! So what are puzzle dog toys? Puzzle dog toys are dog toys where the dog has to figure out how to get the “goodies” inside. Goodies can be treats or (in the case of the plush Kyjen Puzzle Dog Toys) squeaky toys. Fun Kyjen Puzzle Dog Toys include the Hide-a-Squirrel, Hide-a-Bee, Snakes in the Grass, and the I-Qube. 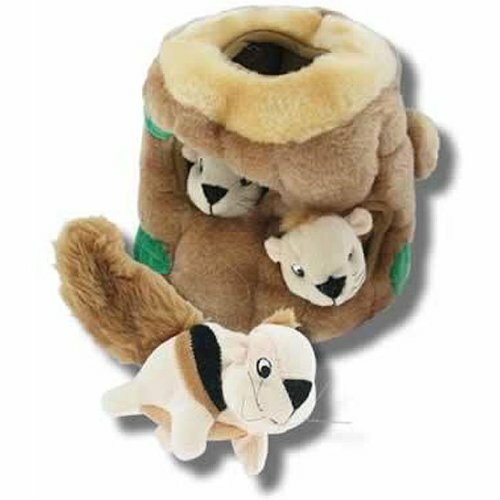 The Hide-a-Squirrel is a plush tree stump with little squeaky plush squirrels inside. Likewise, the Hide-a-Bee is a plush bee hive with little squeaky plush bees inside. The fun is for your dog to figure out how to get the plush squeaky toys out of the tree stump or hive. Some dogs need mental stimulation as well as exercise or they get bored and do something destructive like dig or chew. The Kyjen Puzzle Dog Toys are great for these types of dogs. Well, actually, they are great for almost any dog with two exceptions. The Kyjen Puzzle Dog Toys may not be good for dogs who like to “kill” their toys by taking out all the stuffing. Maya is like this so I have to supervise her when she plays with them. I take them away from her the moment she chews a hole in them so that she can’t take out and accidentally swallow the cotton filling or the squeaky. The other exception would be dogs who just have no interest in trying to figure out toys. Sephi likes squeaky toys but she has no interest in trying to figure out how to get them out of the plush container – even if puzzle dog toys have food in it. If your dog likes squeaky toys and likes to solve puzzles, then Kyjen Puzzle Dog Toys might be for him. If he has a tendency to “kill” his squeaky toys, no worries. The Kyjen Puzzle Dog Toys also sells replacement squeaky toys.